If spots on your back, ‘backne’, back pimples or whatever you want to call them are your problem, I think I can help. It’s surprising how often I get asked “how do I get rid of spots on my back?” but it’s not something people will readily discuss despite it happening to so many of us! Also being a not altogether accessible area, it can have its complications. What causes spots on the back? Even if you don’t have a ‘hairy’ back, spots on it are blocked hair follicles and the tiny, almost undetectable hairs become ingrown. These tiny hairs then coil inside the follicle and can gradually infect. Spots on the back is definitely not a sign of being dirty, unclean or particularly unhealthy. You’ll often find spots in most places on the body where your clothes rub and/or you get sweaty. Ingrown hairs tend to sit more on the surface and although can become infected and nasty, they’re not quite the same as acne. The thing to look for is a head; if there’s a yellow-head then you’re a lot safer as risen through to the surface. If it’s an isolated one of two spots or on that’s particularly nasty, get someone to remove it for if possible (mum’s are the best for this and they don’t care!). Popping or draining multiple spots on your back isn’t advised as we tend to reach around and scratch at them rather than remove them carefully/precisely. 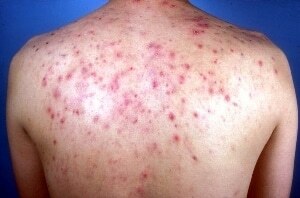 If you suspect acne on your back, this needs looking at by a GP/Doctor first and may need a referral to a dermatologist. This can be the visible symptoms of a deeper skin infection and often needs more than just skin care, however I strongly advise the use of skin care to accompany your treatment. The spots tend to be sore and in larger patches rather than isolated blemishes. These can create wounds that leave deep scars. Acne is often very uncomfortable. Firstly ignore all these acne home remedy acne treatments that talk about rubbing lemons and toothpaste all over the place. It’s utter crap and this isn’t the 1800’s; we live in the 21st century and have come a bit further than that. If it sounds too good to be true, it probably is. Do not use Sudocrem on anything else other than an itchy/sore bum-hole; that’s what it’s made for and although it might temporarily relieve face and bodily acne symptoms in the very, very, very short-term, in the long term you’re heading for a world of trouble. I know, from my analytics data – because I’m so fancy schmancy – that a lot of you reading this article over the last 2 years have been late teens to twenties and I know that particularly if you’re a teen, your funds aren’t the biggest and this is a time when spots on your back can be the worst! I’ve picked products that are effective, easily available wherever you live (even in the US) and don’t break the bank. 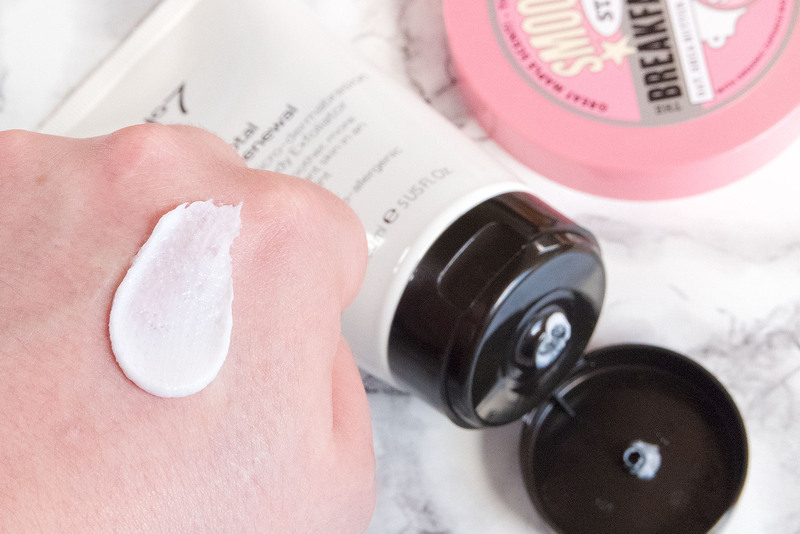 For this article, everything was bought at once from my local Boots. Over cleansing the skin will make it works and break down the skin’s moisture barrier making the problem worse; just cleanse your back every time you have a shower using a sponge on a stick (or something similar); it doesn’t need to be more often than that. Do cleanse as soon as you’ve been to the gym, that’s a big one; having a sweaty back for hours will clog the pores and worsen the situations; make sure to jump in the shower relatively soon after working out and get rid of all that sweat. Also change your t-shirt as wearing sweaty underwear will only make the problem worse! If you’re a lycra lover, this is not great for back spots and acne. Wear looser fitting clothes made from natural, breathable fabrics such as cotton. Often overlooked, but many people get spots and acne on the back due to washing their conditioner out leaning backwards, leaving the skin covered in rich moisturising ingredients. If this sounds like you, shampoo and condition your hair forwards and make sure your face is the last think you wash; or, cleanse your back after shampooing and conditioning. So now you hopefully more about the spots on your back and what they are. This is my definitive guide on how to get rid of them without spending a fortune and looking after your skin’s health. N.B. If the spots on your back appear like acne, first get them diagnosed. For spots that are tender and very sore all the time, please avoid this step or at the very, very least, use your own personal judgement and caution. With acne if you rupture it, you can cause it to spread and make it worse. Because those pores are clogged and hairs most likely trapped, it’s time to exfoliate to remove dead surface skin cells and release those hairs. I regularly use a body brush to keep both my back and bum clear. They really work well. 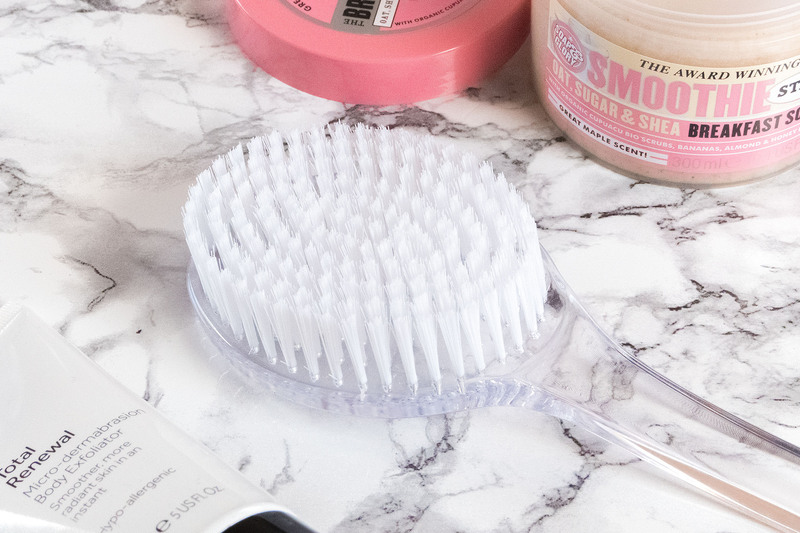 Using a body brush with your cleanser is my favourite way to unblock and unclog the ingrown hairs on the back as it’s not the easiest place to reach. Don’t go nuts with it as you can make the skin a little tender. Make sure you keep the brush outside of the shower cubicle and once a week – pour a little boiling water on the brush. One of the worst mistakes using brushes on the body is to let them fester. This one is only cheap so replace often – if it goes pink, throw it immediately. This Body Brush is from Boots and is part of the Boots Essentials range costing £3.99. I much prefer these to wooden ones as they’re easier to clean, cheaper and more hygienic. Body Brushes like this are available from most pharmacy/drug stores. Now this is a tough one. Body Scrubs are 100% the best thing to use for back spots, but obviously it’s not easy to get into a position to do it yourself. Ideally get someone to help you; this is nothing to be embarrassed about – however, you could look at an exfoliating loofah instead – just don’t go mad with it and keep it clean and hygienic. Body Scrubs contain salt and refining particles that will more forcibly remove surface dead skin whilst increasing blood flow which is great for fighting infection. Don’t go mad with these, as you can easily make your skin raw which is not what we want. Only use a body scrub 1-2 times per week. This is just fantastic and although I bought this on a whim during my hunt, I’m a convert. This is a really powerful and strong scrub with larger and micro exfoliating particles. Apply onto damp skin (not soaking wet) and massage in gently using circular motions then rinse off. It’s fragrance free and hypo-alergenic so great for sensitive skin. This is my number one choice for helping to get rid of your ingrowns. Boots No.7 Total Renewal Micro-Dermabrasion Body Exfoliator is £11.50 here from Boots. 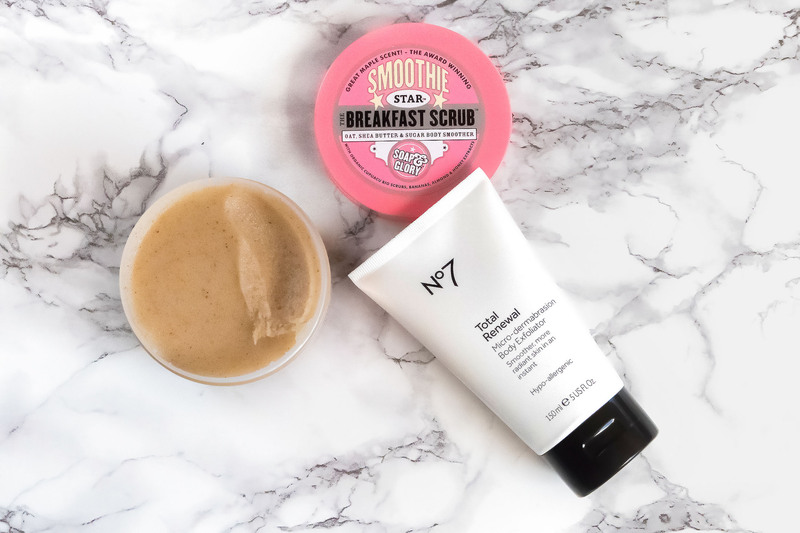 Soap & Glory Smoothie Start Breakfast Scrub is the scrub everyone has been raving about! Again another powerful scrub but this is a little more luxurious in terms of fragrance and different ingredients. It wins countless awards and the blogosphere raves about it. Smelling like maple-syrup, this contains organic capuacu scrubs, bananas, almonds and honey extracts. Again, massage into damp skin in circular motions then rinse off. It leaves skin feeling soft too due to the hydrating ingredients. 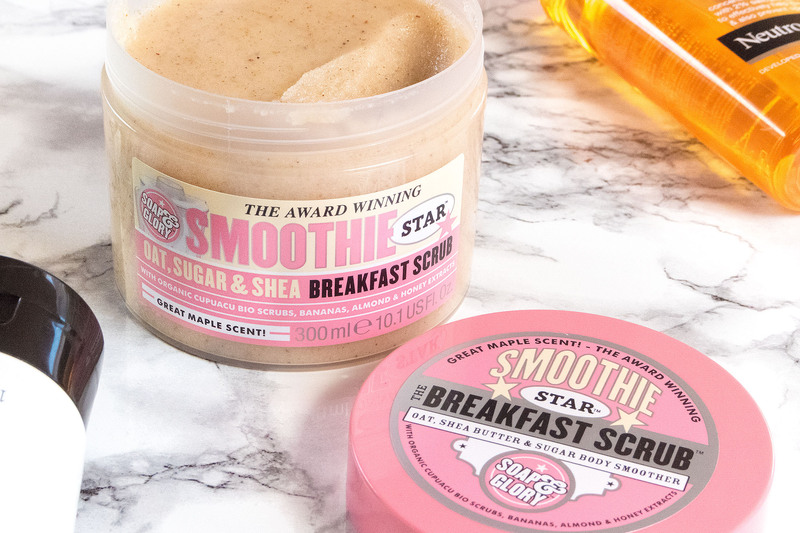 Soap & Glory Smoothie Star Breakfast Scrub is £8 here from Boots. If you’re US based then definitely check out the Neutrogena Body Clear Body Wash: Salicylic Acid Acne Treatment with Pink Grapefruit. It’s my favourite acne/spot body wash but unfortunately isn’t available here in the UK. If you are based outside the US, then there’s the Neutrogena Visibly Clear Spot Clearing Wash with 2% Salicylic Acid. Although this is a face wash, it works great on the body and is brilliant on the back, bum and well, everywhere! Visibly Clear has a very gentle citrus fragrance and the key ingredient is the 2% Salicylic Acid that exfoliates surface dead skin cells by breaking down the bonds between dead and new skin cells. Just apply onto a body sponge and massage in. It’s the actual motion that activates the exfoliating properties of the salicylic acid so no need to leave it on or anything. 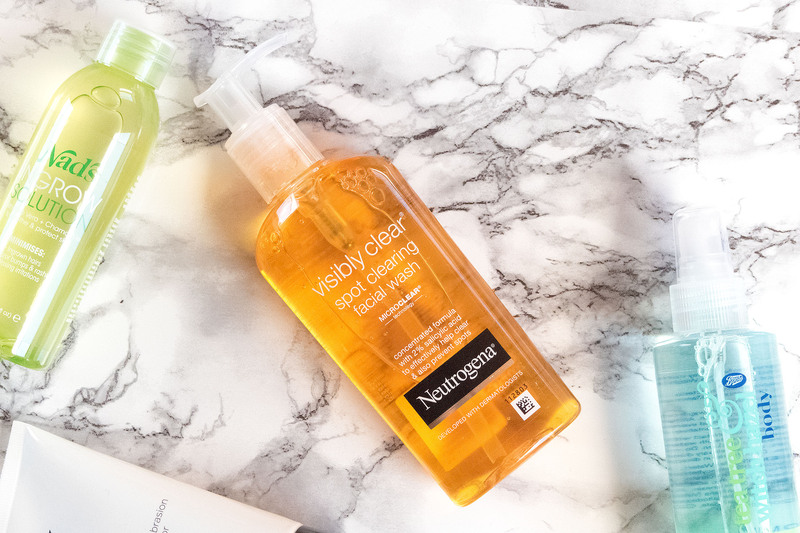 Neutrogena Visibly Clear Spot Clearing Wash with 2% Salicylic Acid is available here from Boots for £4.99 but you’ll find this on most supermarket shelves. The most common reaction to spots is the want to dry them out. Once you do this, the surface dead skin cells return almost immediately and then begin to block the follicles all over again. There’s hydration and moisturisation; the former refers mostly to water-based products and the latter tends to refer to oil-based products. Therefore use a hydrator that is non-oily and non-blocking to rehdrate the skin. Get yourself one of these. It’s a Long Handled Lotion applicator and are sold mainly through shops that specialise in assisted living products for those with decreased mobility. Simply pour your lotion into the head and get massaging – make sure you regularly clean it out with boiling water. This one below is from Lloyds Pharmacy and is £5.99. Using aftersuns is the perfect hydration treatment for curing spots on your upper and lower back. They’re often aloe vera based, oil free and loaded with hydrating ingredients to calm and sooth the skin. Sun damaged skin and spot/acne need treating in a very similar way funnily enough. Just make sure whichever After Sun you choose, it’s a gel formula rather than a creamy lotion. 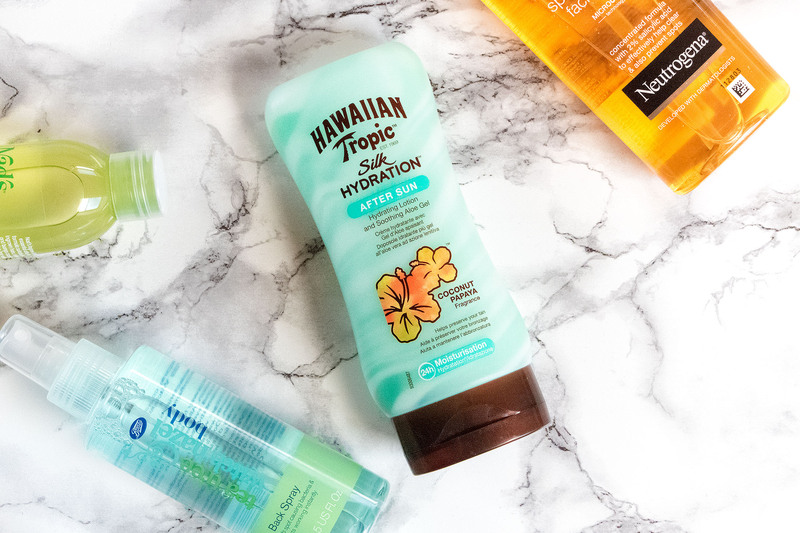 I love the feel and effect from Hawaiian Tropic’s After Sun, £7 here from Boots. 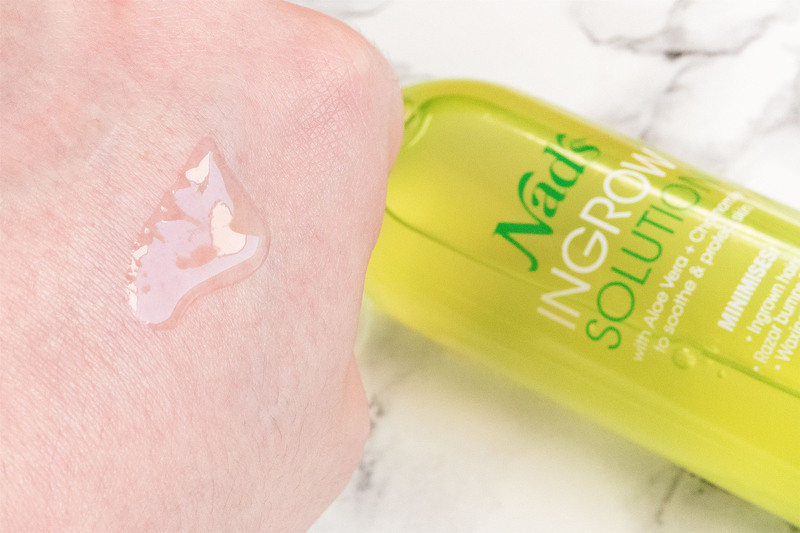 This treatment from Nad’s is water, alcohol and aloe vera based with chamomile, green tea and grape. 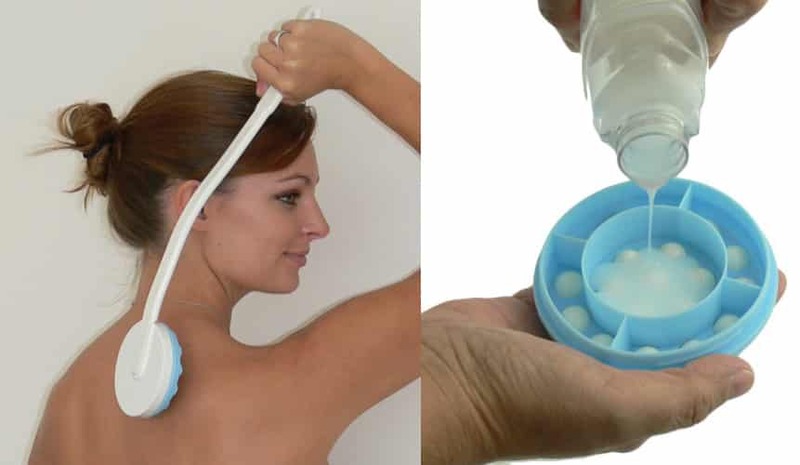 Best used at night before you go to bed, squeeze a small amount out of the bottle and massage into your back using the back applicator above. It disappears almost immediately and is fragrance free. Keep an eye on your skin whilst using this as the alcohol can be a little drying. Make sure you moisturise with your after-sun whenever you cleanse the skin, this should keep things balanced. 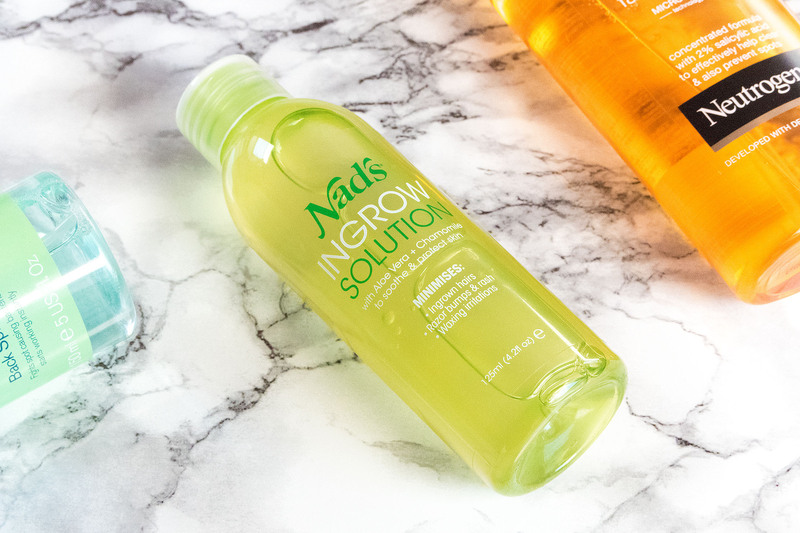 Nad’s Ingrow Solution is £10.49 here from Boots. Perfect, particularly if you go to the gym or tend to get a bit sweaty on your back; once you’ve gone through the steps and before you pop your t-shirt on, using a small amount of talcum powder on your upper and lower back will make sure you stay dry during the day. Cuticura’s Talcum Powder, which is now over 150 years old, is filled with minerals and allantoin which help condition and heal the skin, all whilst keeping you dry. 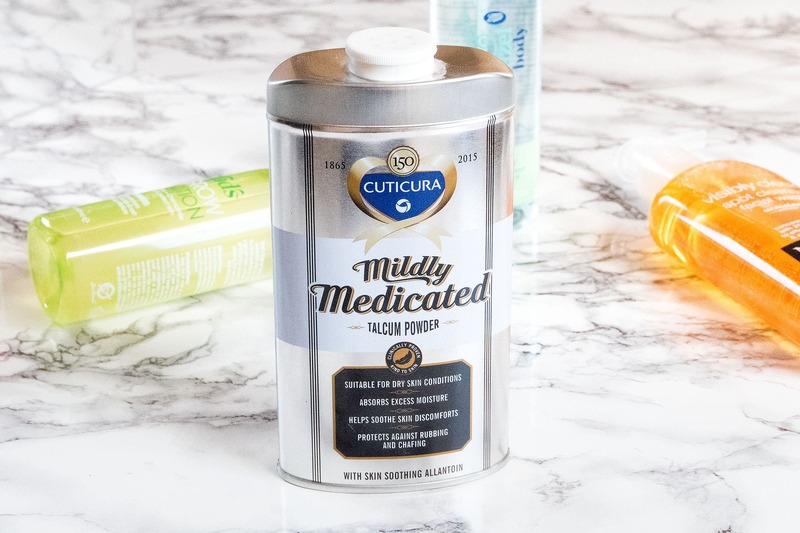 Cuticura Mildly Medicated Talcum Powder is £2.79 here from Boots. One of the only body blemish sprays left on the market, but still a good one. Murad used to have one and Clinique used to have one but it seems acne body sprays are very hard to find! Boots have launched theirs which contains soothing witch hazel, antibacterial tea tree as well as exfoliating salicylic acid. Spray this on your back before you go to bed and leave it to dry before putting on underwear. 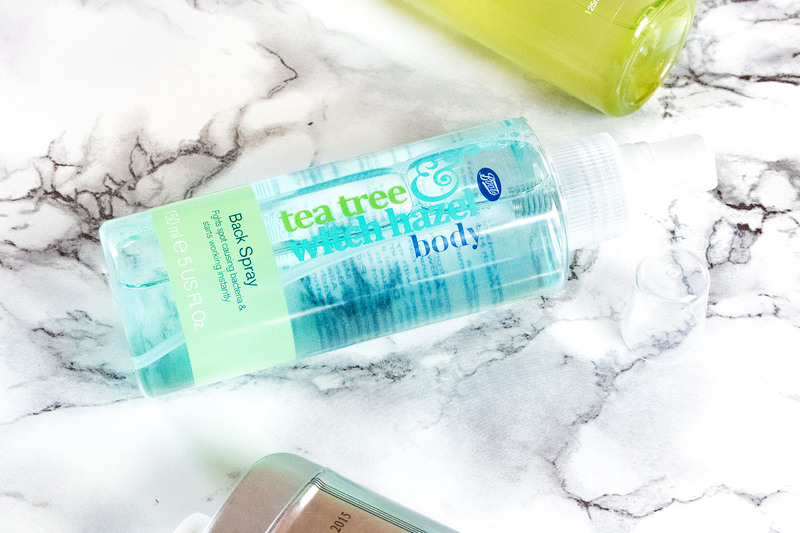 Boots Tea Tree & Witch Hazel Body / Back Spray is £4.99 here from Boots. This article first appeared on MANFACE written by Thom Watson. It was published on Tuesday 7th March 2017 and was last updated on Monday 3rd April 2017 at 12:25pm. 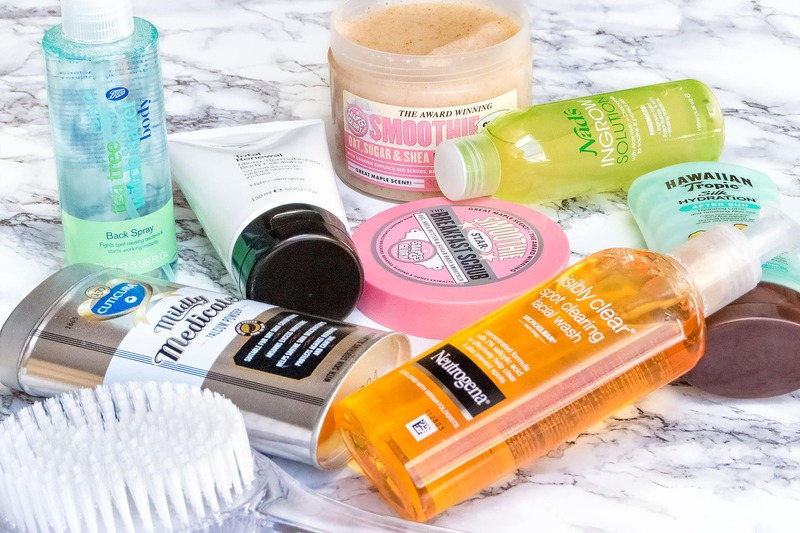 It's categorised under Acne, spots & blemishes, Boots, Cleanse, Editorials, Exfoliate, Neutrogena, Treatment where you'll find more related content. I can definitely say that now that my long hair is gone spots are my back are (mostly) a thing of the past – praise be! I’m guilty of leaning back in the shower when washing out conditioner BUT am doing my best to break that habit.